Tonight I started to configure my new Windows Phone 7, the Nokia Lumia 800. I was lucky enough to receive this phone when I attended the Windows Phone 7 Bootcamp in London, which was part of UK Tech Days, which is organised and run by Microsoft. While doing this, I got a distinct feeling of deja vu, as I recently applied this update for my HTC HD7. 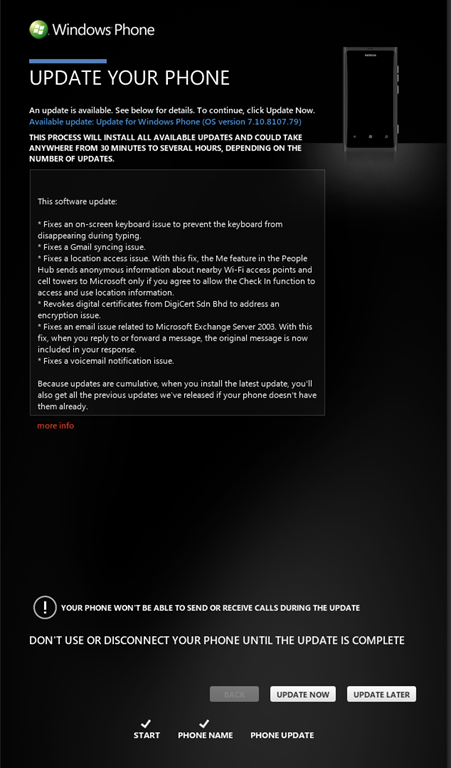 If you compare this to the previous screenshot, you will see that there is no mention of the “HTC Update for Windows Phone” which was present on the last update screen. I had heard that mobile phone operators were pushing out their own updates, in this case HTC, but I have never seen it first hand. It was also my understanding that mobile operators would come out with their own updates, not bundled with an Operating System update, but it appears that this also isn’t the case. I would have also thought that in this case, the build number would also be different, in order to show what is, and what isn’t installed on a particular handset. Quite why this hasn’t been done, I am not sure. Perhaps this is what is included in the firmware version number for the handset. I am now going through the process of re-installing the applications that I have on my HD7, onto my Lumia. I asked the question while I was at the Bootcamp whether there was anyway to automate this process, but the answer was no. One annoyance that I have found with the Nokia Lumia 800 is that at the minute, even after applying the latest update, the Internet Sharing function for the phone is not available. Any noted here this is a fundamental feature on my current handset, and I am going to miss having it. While I was at the Bootcamp I specifically asked the Nokia representative whether this feature was going to be available on the Lumia, and I was told that it would. be, assuming that the Mobile Operator enabled it. However, after talking directly to 3 this afternoon, they are saying that it is Nokia that need to first enable this feature. Having done some googling, it is not clear to me at this point who is right and who is wrong. Even on Nokia’s own support forum there are mixed comments. I have seen references to an update being provided in early 2012, specifically from Nokia Italy. Hopefully some more concrete news fill be released soon.